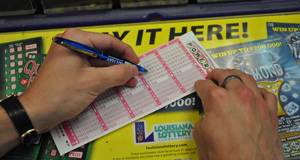 BATON ROUGE – As of today, no one has stepped forward to claim a $50,000 Louisiana Lottery Powerball prize won on Oct. 24, 2018. The winning ticket was purchased at Champion’s Express Mart in Boutte and is set to expire April 22, 2019. The winning ticket matched four of the five white-ball numbers drawn and the Powerball to win $50,000. The winning numbers for the Oct. 24 drawing were 03-21-45-53-56 and the Powerball number was 22. Ticket purchasers must be at least 21 years of age. The Lottery encourages responsible play and urges anyone or friends of anyone with a gambling problem to call toll free 1-877-770-7867 for help. A list of large unclaimed prizes set to expire in the next 90 days can be found on the Lottery’s website at www.louisianalottery.com/unclaimed-prizes.